2016 Update: Links have been updated as of 2016. See our most recent discussion on professional tote bags here! Last week, we suggested Hayden-Harnett’s Ibiza “convertible flight tote” to readers — intending to recommend it as a tote bag for when you need to take home approximately fifteen pounds of paperwork — so we were a bit surprised when commenters railed against it as looking cheap as a purse (to us: duh, of course, your purse is separate from that!) and bad as a carry-on (again, to us: duh, of course, because the best soft carry-on is LeSportsac — how can that even be debated?). After we got over our internal monologue, we’ve been thinking about all the different tote bags we’ve seen through the years. To be clear: These are not the kind of tote bags you carry with you to interviews — nor are they the kind of bags you use to carry a magazine and some papers. These are the bags that you keep somewhere in your office and pull out on Friday afternoon when you suddenly realize you have to read or review thousands of pages over the weekend, and don’t feel like trying to box it up (or come into the weekend). There are a few different varieties of them, and we’ve always thought they convey bits of your personality to people. Readers, what’s your favorite for this kind of tote bag? Do you think we’re accurate in our “personality” types? The “fancy” but practical bag. Think Longchamp, the Ibiza bag, or any bag consisting of nylon and leather in a combination. The nylon keeps the bag lightweight (aside from those fifteen pounds of papers, of course) yet very, very durable, and the leather adds a bit of glam as well as sturdiness. 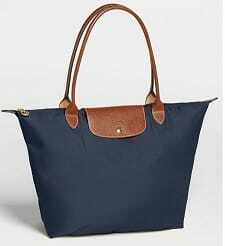 We have packed our Longchamp to the brim and it always retains its shape. (Alas, the largest sizes of the Longchamp bags are not available online — but for reference, pictured at left is Longchamp ‘Le Pliage’ Two Tone Shoulder Tote, available at Nordstrom’s for $125.) This is our preferred look — it shows you care how it looks while you’re breaking your back doing work. The “luxury” bag — such as Vuitton or Goyard. For our money, the luxury bag is frequently a bit impractical — they never seem big enough, we’d worry about ripping the leather, and — considering the purpose — it seems a bit like a waste of money. But, if you’re trying to convey that you’re a woman who cares about luxury at any cost, this is your bag. 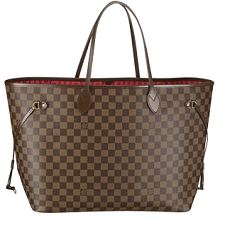 For practical purposes (weight and durability), we would advise you to go with a treated canvas bag instead of a leather one, such as the Louis Vuitton’s “NeverFull GM,” available at LouisVuitton.com for $750. The wheeled bag. This one tells people that you’re a) smart and concerned about your health, b) serious about getting paperwork to and from the office, and c) possibly aren’t driving/being driven to and from work. All said, these aren’t bad things to convey in today’s economy. The downsides: it’s not very fashionable, and if you end up with less papers (leaving some at home, recycling them, whatever) you’re still encumbered by the rolling bag. 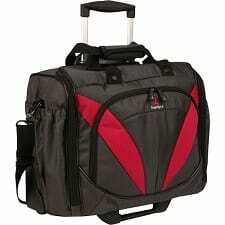 Pictured: Travelpro Tote TPro Xtreme Lite 15 Rolling Tote Granite, available at Amazon for as low as $84. The backpack. This is our least favorite option, if only because it tells people you haven’t really upgraded your bag (and possibly your style) since you were in school. Pictured: Deluxe Book Pack, available at L.L. Bean for $39.95. The boat bag. The funny thing here is that, by and large, the female partners we know use these to shuttle their papers to and from work. It conveys that you’re definitely driving/being driven (that open top is just a disaster waiting to happen on public transportation), and it can be a subtle way of telling people things about you: I gave enough money to Charity X to get a tote bag! I went to Conference Y and received this tote bag! All in all, not a bad option to keep at the office. Pictured: Boat and Tote Bag, Open-Top, available at L.L. Bean for $30.95. I agree that the particular wheeled bag you feature is not fashionable, but I think that there are better options out there. I have the older model of the Kensington Contour Bag (http://www.amazon.com/Kensington-62430-Traveler-Notebook-Computer/dp/B000FLNS80/ref=sr_1_7?ie=UTF8&s=books&qid=1251745635&sr=8-7) and have carted it everywhere for a few years. It’s served me well and it’s carry-on friendly. It’s also practically waterproof (even through puddles of water). I’m not really sure how I feel about the newer model (http://www.amazon.com/Kensington-K62533US-Contour-Notebook-Notebooks/dp/B0011YAOBE/ref=sr_1_1?ie=UTF8&s=office-products&qid=1251745635&sr=8-1) but I think it’s actually trying to be *more* fashionable, and I definitely prefer it over the one above. What do you think of Coach bags? Used to love them – until about the year they did the Crayola-scribble and started splashing the C’s all over everything. I think quality started to suffer then, too. A quick skim of the “business” bags on their website – I would consider the madison julianne depending on how it felt in the store, but the rest don’t look worth the money. I can’t stand any designer that splashes its logo all over its bags (a la the crayola Coach C you referenced) but I have a black leather Coach tote that is large enough to fit a few legal sized folders and has held up very well over the 3-4 years I have hauled it to court and client pitches and home. It is essentially a very large purse but works well for hauling documents (and a laptop when needed) around because I dislike carrying any type of brief bag/tote plus a purse. Plus it looks professional – in my opinion. Of course, when I’m just carrying documents home for the weekend I tend to grab whatever free tote or brief bag that is lying around my office and I don’t think too much about the fashion side of it since that is strictly a utilitarian purpose. The outlet still carries a lot of the more traditional leather designs without the C’s all over everything. I find them to be far more timeless than the department store offerings. There are also far more sales and deals available, so you can get something at a reasonable price. As long as the newer styles with the handwritten and/or patchwork look-a-like C’s are avoided, Coach is still a sleek, quality bet. My black leather Coach bag has lasted 6 years. LL Bean makes a boat and tote with a zip top (which I have, but don’t necessarily use for work). That would solve the issue with papers flying out. I should also mention that I typically carry a Vera Bradley Large Tic Tac Tote in one of their more subdued prints–black background. It is quilted and very lightweight–yet surprisingly sturdy. The straps are also the perfect length to put it over the shoulder, yet not have it flopping around. I am 100% in favor of a backpack for carrying home large amounts of papers/files/books. Regardless of whether or not I look like a student, it is better for my back/shoulders and sturdy. I totally agree – backpack all the way for me. I walk and take the bus, and no way am I going to a) roll a wheelie through all the street muck and then track it through my house; b) slouch to one side with a heavy bag on one shoulder; or c) bend forward like a hinge with the weight of a sling bag like the Le Sport Sac. Right on. If I’ve got to haul around fifteen pounds of anything, I’m going to use a backpack. It’s the only way I’m going to make it home without pulling a muscle or wearing myself out. My trusty Jansport (which saw me through high school, college, and law school!) may look a bit dorky, but it’s definitely better than staggering around, exhausted. I am acquainted with a senior female partner who uses a backpack for everything – even brings it to court. She prefers public transportation, so I definitely see the practical aspect. She is actually really well-dressed otherwise – quite curious. I take a lot of pride in my appearance, including accessories, but I use a backpack for work. I’d much rather stand up straight when I’m 50 than carry a cute shoulder satchel. And I use public transportation and I’m not going to run over toes with a wheely bag. I keep dreaming I’ll find a cute professional backpack — best I can do is a high quality black one. if it were possible to move those files into digital format, then that’s the way i would go. Regarding the LV “Never-Full”–I got one as a present when starting law school, and have used it nearly daily for work, school, and as an overnight bag, going on about 3 years. Yes, it’s definitely a little in-your-face and label whorish. But I can fit 3 or 4 days worth of clothes and toiletries in it. Or a laptop and many very heavy textbooks. Or a bunch of files (it’s nice and long) and a pair of shoes or two, and umbrella. Your fears about durability are unjustified–this bag is seriously never going to die. It looks nearly as nice as the day I got it (and I promise, I am not known for taking good care of my stuff), and those handles, despite carrying exceedingly heavy loads, are still sturdily affixed–and a nice length for carrying. I’m honestly just promoting this bag because despite looking ridiculous, it’s insanely practical–so I’m hoping to encourage more people to use it, so I stick out less. Selfish, but honest. Lisa, I also use a Kate Spade diaper bag. it’s super sturdy, classic and classy. I love it. And it get compliments on it all the time. I have a Coach diaper bag. It’s pretty much the best thing ever, but a little large for daily use unless I’m planning to use it for a gym bag as well. I hate you, Corporette, and you, k, for giving me a case of LV lust that I had managed to avoid until now. That looks like the perfect bag and I want it so bad I can taste it. I’m also digging out my Coach diaper bag to decide if it looks too diaperesque! The Louis Vuitton bag is not leather, it’s canvas. The only part that is leather are the straps. 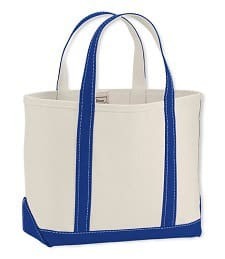 The LL Bean Boat N Tote is UEBER preppy/old money/ I summer in Maine. It’s also very useful for car trips, grocery runs, you name it. I have two of the largest size. They are used all the time. You’d be surprised. I use the Boat N Tote, the Kate Spade Diaper Bag, and the Tory Burch tote bag. They are all nice, sturdy, square shapes that hold a lot of documents neatly, don’t look too dorky, and are lightweight. And they all go on sale and don’t take up a ton of space in the office. I obcess about tote bags these days. All of them are fine on the subway–even those without zippers–as they keep the papers organized within well. I heart my Boat and Tote. Use it all the time. I’ve had it for 15 years, it looks great. My only regret is that my name is on it, which makes it even preppier. When I want to be less Waspy, I carry a Hable Construction bag. It’s a modern take on the Boat and Tote. I can vouch for the LV neverfull. I have had mine for almost a year and a half. I carried it every day studying for the bar- so it could withstand the abuse of those heavy barbri outline books. While the straps will cut into your shoulders if you attempt to carry too much weight, it is very durable and you can easily fit several files and a second pair of shoes. However, I think the momogram is a bit much for court, so I really only carry it on casual Fridays when I don’t have court or a meeting. I just bought this in a dark teal. I’m a student, so I was looking for something under $100. It looks nicer in person than the product image- the middle seam stitching isn’t as puckery. I have two LL Bean Boat and Totes. One with my initials on it and one from the law firm I worked at. One has a zipper and long handles so I can easily throw it over my shoulder and the other is open with shorter handles so its definitely more of a beach tote. The totes are incredibly preppy, but also really sturdy. I use it for everything — overnight bag, carry on, law school books. This summer, while I was working at a firm, I used it to carry my change of clothes for all the outdoorsy firm events we had after work. Perfect! They’re pretty cheap (compared to LV and Coach) and there are a lot of options in terms of color, size and handle style so you can design your perfect Boat and Tote! What about a nice mid-range Cole Haan? I have a large black leather tote that I’ve used for 3 years. It fits my laptop, some papers, waterbottle, scarf, etc. and , I think, looks more professional than the options listed in this post. I have carried a zip-top monogrammed L L Bean boat ‘n’ tote bag (long handles in black) for the past three years of teaching — it holds a lot, and when not in use, the “zip top” lays flat against the inside of the bag. It’s a good compromise. I have noticed this year, though, a lot of people at my work returning to classic JanSport backpacks — I blame the economy… less is more at the moment. The LV Never-full. It can hold up to 500lbs without strap failure, holds a LOT, including my lap-top in the sleeve, side straps are adjustable to control size/shape. Its a throw-back to the luggage collection that LV is actually famous for, and as a carry-on, I can usually throw my bag inside of it and get past that 2 bag rule for carry-ons. Plus, its a gorgeous bag… no need to be unfashionable…why the heck do we work so hard if not to enjoy the fruit of our labor! I’ve had my LLBean Boat & Tote bag for 35 (!) years and am still carting around library books, beach stuff, and everything else in it. It doesn’t look very pretty at this point (although that well-worn look has its own appeal), but it does the job! depends on the volume you’ll want. For schlepping heavy papers, I’d go with a medium or large (if we’re talking binders) with long straps. X-large holds a family’s-worth of beach toys (my mom still uses hers 15 years later…) so it’s probably more room than you need. If you look at the site, they show pictures of each size next to an actual person. I had a smaller version as a purse but got the large size as a gift during 1L. Durable enough not to show wear even from my laptop (which I keep in a protective neoprene sleeve inside the tote) and multiple casebooks … and light enough not to add to my already heavy load! I am suprised no one has mentioned (including the OP) a briefcase. Tumi and Lodis both make nice, feminine ones. Am I the only women that carries one? Mine has a laptop compartment if I need to take my computer home, if not, I stick more documents in there. I also have a longchamp that I received as a bridesmaid’s gift, but it is pink, so not very professional. I got this rolling bag from Ebags a little while ago. I get tons of compliments on it. It’s great for carrying my laptop and files. I was initially hoping I could also fit clothes/toiletries in there so it could be a weekender, but this bag is not equipped for that. I would never have considered a backpack, and even after reading these posts here I still don’t think it would be the right fit for me. I have some serious back issues. However, I live and work in the Southern CA region so dragging the case through snow/ice/mud/etc. fortunately is not a concern for me. Also, my two cents re: Goyard: I received one as a gift and really did not “get it” at first – no zipper, what’s up with that design, etc. Now, two years later, I am a total convert and I love it. It is super-strong and sturdy and can hold a lot of stuff. When you don’t have a lot to carry, it’s very lightweight and is constructed in such a way that it folds down to be a regular-sized bag. I seriously love mine and use it all the time for a variety of purposes. The dual wheel system is a favourite with lots of folks. Downsite is, zuca is rather pricey, which is why I can’t write a first-hand review here, unfortunately. At any rate. Wheels for me! Once I had this moot-court-style competition at my university where you were handed a case and had a very limited time span to prepare for the case. You had to drag around tons of books with you that you may or may not have turned out to need, since the topics of the court cases were kept secret until the assignments were handed out. Stupidly, I loaded all of my books into a sports bag… There really is nothing like dragging around a third of your body weight in a sports bag, dressed in a way too hot suit in 30 degrees centigrade sunny weather and no airconditioning. I got a wheels bag the week after that, and I’ve been using it for a lot of things ever since, though none of them paperwork-related. Nonetheless, I found the bag to be such an ideal thing to have, I wouldn’t dream of carrying heavy stuff anymore. I have only 1 spine and it’s been through a lot as it is, it’s got to last for another 60 years or so! I love the Town & Field Tote from LL Bean. Plain leather, sturdy and holds a ton of files as well as laptop. Looks similar to the classic Coach leather bags but at only $129, its a deal! I can second the Town and Field tote from LL Bean. I have the dark brown and get as many compliments on that cheap bag as my designer bags. Different totes for different reasons. I still use my Kate Spade diaper bag (my son is 6). I use it on vacation instead of a purse. I can also throw papers in it. It was OK for Court until it got an ink stain on the bottom. I got one of those LL Bean Boat Bags for Christmas and thought I would never use it. I use it all the time. Swim bag, bag to put toys in to travel, it is strong enough to hold binders. And I have my rolling brief bag. And my purse. And my suitcase. Funny, my husband seems to travel with just one bag. Hmmm. MG, thanks for the recommendation of the Town & Field Tote from LL Bean. It looks great. Do you have a sense of how heavy it is? Most bags I’ve seen in that size seem to weigh in at 3-4 lbs just for the bag, which is why I prefer canvas type bags or wheeled bags. I’ll definitely recommend this to others who have stronger shoulders, though! No mention of the trusty messenger bag. 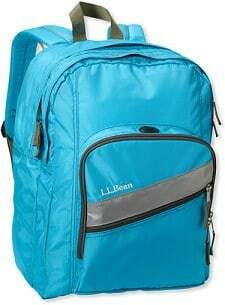 I personally find it a staple, more functional than a tote, and more appealing (at least for me) than a backpack. I use a smaller messenger bag (Crumpers) for small files and day to day functions and a larger (Patagonia Half-Mass) for large files. I saw some very nice looking new ones at the Patagonia store the other day that were nice looking, not sure what they were though. Certainly, the messenger bag isn’t as “fashionable” as a name brand bag, but it can have style (Timbuk2 has some very cute new materials) and be incredibly functional. No offense, but I wouldn’t be caught dead in a backpack unless I am camping. coming late to this party: you pretty much hit the nail on the head for me. i’m fan of the good old boat & tote (many colours with monograms), lv, *and* longchamps. that way i can beat the crowds along my commute. I’d be wary of rolling bags in the DC Metro, too many stairs make them fairly inconvenient, not to mention the loooong escalators. For those who avoid leather or like the technical outerwear look, Built makes great stuff. Their duffel bags are wonderful. Ok…honestly…I’ve conducted a few callback interviews for my nyc v10…and any girl who walked in with (or, for some reason, admitted she owned) a treated-canvas monogram-print bag would be, if not instantly dinged, severely disadvantaged. Obviously you can be as offended as you like by this post, but I’m real, and there are LOTS of others like me. Incidentally, the most recent person with whom I had this conversation was a client of ours. So, you should think twice before brandishing your LV in the GS offices too. I can’t decipher what you are trying to say. Do you like or dislike LV bags?